The tomato is the edible, often red berry-type fruit of the nightshade family (Solanum lycopersicum). The tomato is consumed in diverse ways, including raw, as an ingredient in many dishes, sauces, salads, and drinks. There is no such thing as too many tomatoes it is just not possible to grow too many,we tend to grow 60 or more plants and start with more than a hundred seedlings. We usually save some of our own seed but also buy in some new varieties from year to year or accept gifts from our neighbours and visitors. While its possible to buy them year round in supermarkets when you decide to eat seasonally in a cold temperate climate you will not be eating them fresh before June or after mid October in most years. 2015 has been an exception with no real frost until November so tomatoes stayed on the vine until early November. Most of our tomatoes are stored in one form or another savoury dishes, sauces or whole in jars, once the salad season is over tomatoes along with onions and garlic form the base to many of our meals. We normally start sowing tomato seeds in February in an unheated greenhouse, for 2016 we will have constructed a conservatory on the front of our house and will be sowing many seeds including tomatoes in there from January onwards. We start many of our seeds in 3ltr pots instead of flat trays 20 or so seeds per pot, we now use our own compost mixed with sand, vermiculite and crushed oyster shell. This mix helps us in many ways the compost is free and clean from chemicals, the vermiculite holds water and breaks-down slowly and is a soil mineral supplement adding magnesium and iron, the sand helps with drainage and structure, the oyster shell helps with drainage and structure and breaks-down very slowly and becomes a soil mineral supplement adding calcium. Once the seedlings are 3cm to 4cm high we pot them up in to individual 9cm pots using more of our compost mixture. From these they are planted out in to the garden after the last frost, usually mid May. We harden them off by bringing them out in to a sunny but sheltered spot, returning them to the greenhouse overnight if there is any chance of frost. Being able to start them early will mean they need potting up again before planting out, this time to a 3ltr pot on its own with a small stake to give it support. Once we plant them to their final place we use steel spiral supports these mean we do not need to tie the plants to the support they simply grow up the centre of the spiral. 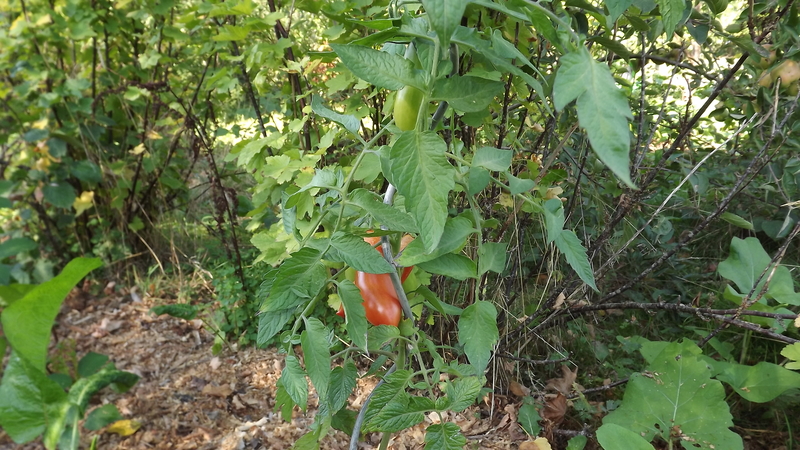 This is a recipe we discovered out of necessity a few years ago we had a very warm wet summer and were hit by a bad case of tomato blight to avoid losing our crop we harvested all our tomatoes green and looked for recipes to use them up. Here is just one of them. A ladle of flour with a tea-spoon of salt and a tea-spoon of pepper works well for us. Slice your tomatoes (any variety will do) quite thick and cover them in the flour mix. Fry the tomato slices in hot fat (Lard from our pigs is the best) until slightly brown. This is a great meal all on its own but also as an accompaniment to any savoury meal they are wonderful. We usually don’t wait for blight now we just start enjoying our tomato harvest early. You can also add other spices to the flour mix cumin, coriander, paprika and chili powder all make wonderful additions to give this dish more variety.